... or "Don't Let Your Rescue Site Go to the Dogs." I don't think I need to go any further on the cliches. Do I? It's all about making your rescue site the most effective it can be to get those worthy rescued pets into forever homes. 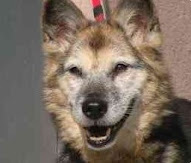 Since older dogs are more likely to be waiting around longer, the Internet is a great medium for getting the word out. I'm a technology guy by trade, but this isn't about the widgets showing slide shows or even the design of your site that matters in my opinion. It's about putting your rescued dogs' best paws forward. What do I look for when considering adopting a dog that I've seen on a rescue website? No "stale" adoption ads - I've heard recently that there are a number of our readers who have gone to adopt a dog only to find out that the dog is unavailable. It may very well be a lack of resources to update the website, but I'd like to push rescue coordinators to stay on top of their online packs to make sure that their sites reflect dogs actively being adopted. The purpose being to not lose these unadopted dogs amidst a pack of dogs already in their forever homes. Regular updates - When you adopt a rescue or shelter dog, it's unclear what you're getting sometimes and how they'll adapt. Hearing about the progress that a dog is making in a foster home gives people hope that if the dog can adapt to living their, maybe they can give that dog a shot in their own home. Showing the progress that a dog made through some medical challenge is also a nice touch to show their resilience. Personality - Let's be clear. I'm talking about the personality of the site here. The dog's personality should already be shining through in the pictures, videos, and descriptions on their adoption ad. The personality of the people rescuing the dogs should shine through in the content that they provide. This means a fun "About Us" page, as well as referencing how the volunteers are each contributing their time for the dogs. I want to know that I'm doing right by the adopted pet, but also by the exceptional people standing behind them. Proper framing of donation information - Rescuing dogs can be expensive. Food, treats, vet bills, shelter fees, and boarding expenses can add up. It's understood that rescues are looking for funds, so make sure that you've made it clear how individuals can be part of your mission, both financially and by donating food, treats, and gently used bedding. Ultimately it's about getting more dogs into forever homes, so if you don't have the time to do it the right way on the Web, put out a call for web savvy volunteers who can drive that part of your online adoption efforts.